I wanted to express my heartfelt congratulations to wonderful author and friend Paula Leyden. 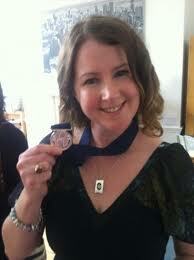 Today Paula picked up the Eilis Dillon Award for her beautiful novel 'The Butterfly Heart'. 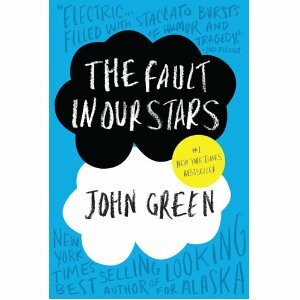 When I first read this novel, I was incredibly excited and moved by it. It has joined my favourite and must-read books. And here they are - the 2012 Children's Book of the Year Award winners! "An imaginative and empathetic supernatural thriller coalesces past and present to explore the complexities of fraternal love and the pain of loss." The Eilis Dillon Award (for best debut) goes to Paula Leyden for The Butterfly Heart! Congratulations to all of those shortlisted, the judging panel for their difficult decisions, and to CBI for ensuring the future of the awards! 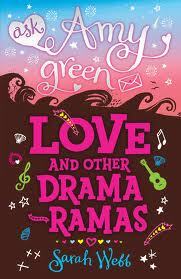 I just wanted to give a quick shout and alert you of my review of Ask Amy Green: Love and Other Drama-Ramas by Sarah Webb. This is the fourth book in the Ask Amy Green series, and the fifth will be out later this year. Here's the link to Inis Magazine , where you'll find it and reviews of other great books you won't want to miss. and to all the rest, I just wish I could have given you all an award because the stories were all great! During my visit to the class to present the awards, I was treated to 3 lovely bits of music (two were sung by the entire class and one was performed by Isabel, a piece chosen to complement her story) and a lively discussion about writing and books. The books the children read are incredibly varied and their discussion was worthy of any conference panel! We could have gone on for the rest of the day. Their energy and enthusiasm and creativity was infectious. So thank you to all the children of the 3rd/4th class of St. Nicholas Parochial School and to their teacher, Wendy Walsh for a fantastic event and allowing me to be a small part of your wonderful class! Busy Weekend... Places to go; people to see.. and events! Yes, this is a busy weekend and it starts immediately. Personally, I'll be at work for the day, then I'm off to Dublin for the CBI conference on Saturday and Sunday. Expect a full report! But for those of you hanging out in Galway, there's still alot to do. First of all, today marks Fascination of Plants Day at the NUI Galway Art Gallery with the opening of a beautiful exhibition at 2pm. 'Our Fascinating Flora' is an exhibition of plant inspired art and photographs in celebration of the first ever Fascination of Plants Day... a must for art lovers, gardeners... and, as it turns out those among us who love storytelling. The marvellous Rab Fulton will be there between 11-12 noon, lending his storytelling talents to all and sundry, so do go along! At 3-4pm Dr. Maria Tuohy and members of her lab will recount the amazing adventures of Jack and the Beanstalk, and everything you want to know about amazing and wonderful beans! As if that weren't enough to peak your interest, the Galway Early Music Festival started Thursday, 17th May and runs through the 20th. 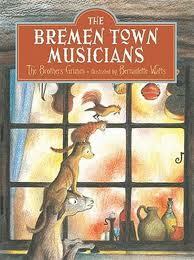 Especially for the family, the Animal House Collective will present (one of my favourite stories from the Brothers Grimm) The Musicians of Bremen. Four tired, old and worn-out animals decide to hit the road and embark on new careers as musicians before their owners get rid of them permanently. But the music they make has some extremely unexpected results. Just to let everyone know... 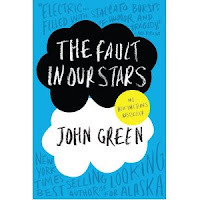 The Fault In Our Stars by John Green is now available in paperback. My recommendation? Buy it; read it; read it again.... you get the picture. Here's the youtube video of Michael D. Higgins announcing Niamh Sharkey as Ireland's second Laureate na n'Og. He tells some marvellous stories himself and talks about children, children's stories, the importance of libraries and children's literature and respecting the integrity of children as readers and as human beings. Oh!!! And his comments about children and actually handling books!!! Just delightful.What a marvellous introduction! Again, congratulations to Niamh! I'm looking forward to the next two years, because I'm sure it's going to be wonderful. It was with great sorrow that I learned of the death of Maurice Sendak yesterday, and I think that can be said by a huge number of us who grew up with his books, whose children grew up with his books or any of us who are passionate about childrens' literature. I took it quite personally; as if I had lost a beloved, albeit crotchety and sometimes frightening, uncle or grandfather. 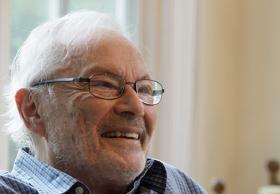 Sendak was known for his unflinching honesty in his writing, illustrations and in his life. Anyone who interviewed him was always taken aback by this, and always a little afraid. Of course, as we all know, the book for which he will always be remembered and associated with is Where the Wild Things Are. This 32 page picture book containing less than 350 words has sold over 17 million copies worldwide, been translated into dozens of languages and adapted into movies, stage plays, musicals. And, when I am being completely truthful, it is my favourite book ever. 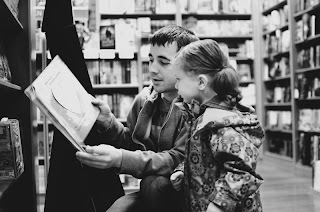 If you have ever been in Dubray Books Galway branch during the World Book Day week-long extravaganza that I insist on submitting my colleagues to each year, and heard me read to the children, you will know that every class I read to hears Where the Wild Things Are. Some of you may have even heard me say that I believe that everything you need to know about life, about being human, you can learn from Where the Wild Things Are. And I believe that. It's honesty and portrayal of emotions, relationship and love is impeccable. Sendak was always honest... he would never lie to children. Farewell, Maurice Sendak. May you rest free and happy Where the Wild Things Are, forever. Big congratulations to Niamh Sharkey!!!! Earlier today, President Michael D. Higgins presented Niamh with her Laureate na n'Og medal, which marks the beginning of her two year term as Irelands' second Laureate na n'Og. "It is a great honor to be chosen as the next Laureate na nOg. I am a picture book maker so my focus as Laureate will certainly be visual as well as literary. 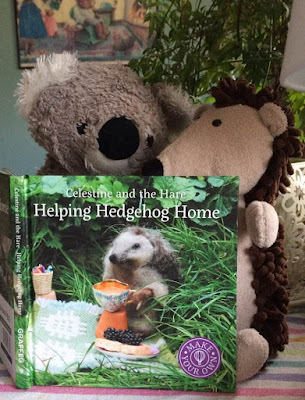 I am going to get to do even more of what I love most - promoting quality children's literature and encouraging children to read, write and draw. 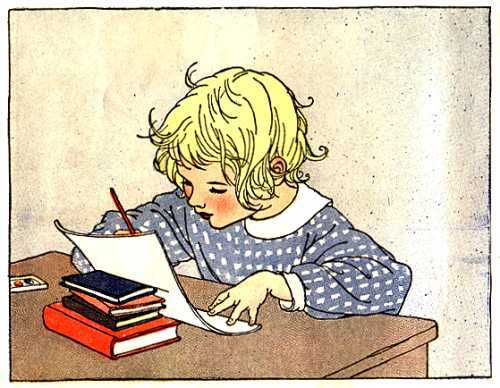 I have lots of ideas that I hope will inspire creativity in children of all ages. 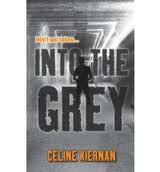 I'm very excited and can't wait to get started"
Niamh follows in the footsteps of the wonderful Siobhan Parkinson. Congratulations, Niamh!!! 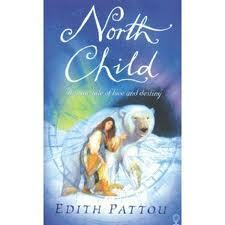 My review of one of my all time favourite books, North Child by Edith Pattou, is up on The Bookbag now! This eloquent retelling of 'East of the Sun, West of the Moon' is truly marvellous and one I return to again and again. 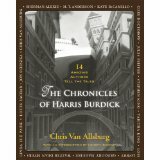 Check out my review (on the 'What ARE You Reading page) of this intriguing, marvellous collection by Chris Van Allsburg. And what a great trailer! A big congratulations to the 2012 Hans Christian Andersen Illustrator Award winner...Peter Sis! Peter Sis has created some of the most magical, exquisite, integral illustrations ever seen in the in the world of picture books. If you don't know his work, may I suggest Madelenka or The Tree of Life... pure magic! 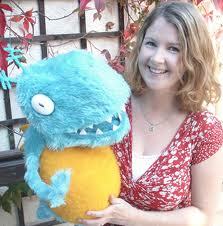 the winner of the CBI Children's Book of the Year 2012 (formerly the Bisto awards) will be announced on 28th of May. This award is now in it's 22nd year! The shortlist was announced in March, the school shadowing scheme is churning away in schools throughout the country to select the Children's Choice award, and the panel of judges that worked so diligently to whittle down an impressive and expansive longlist to and impressive and concise shortlist is now working away even more diligently to hone in on the winners. Hello... just a moment to wish you all a Happy May! There is so much happening now... so much to look forward to.... so many new books! First of all, I'm very excited about this years Children's Books Ireland conference, happening the 19th and 20th of May. 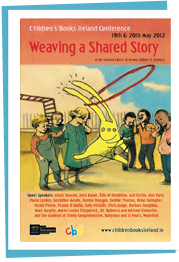 The theme of this years' conference is 'Weaving A Shared Story'... a what a shared story it will be. We have Alexis Deacon, Eilis ni Dhuibhne, Chris Judge, Paula Leyden, Nicola Pierce, Judi Curtin.... and one of the features of the Sunday sessions will be the Emberly family, sharing their enthusiasm, inspiration and knowledge of picture books. Ed Emberly and daughter, Rebecca will be making the trip from the States; while Michael Emberly and his wife, the wonderful Marie-Louise Fitzpatrick will be joining the conference from a little closer to home. There will be so much going on at the conference. 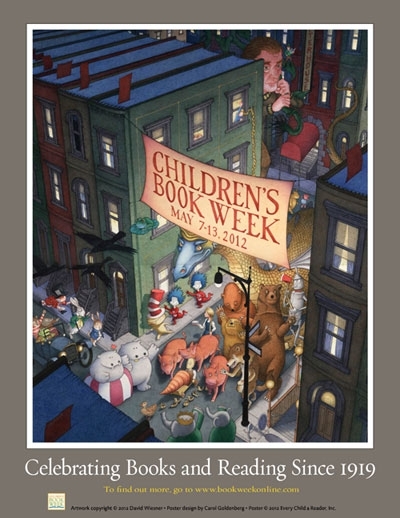 If you love childrens' books... you really should be there, if only for one of the days! p.s. Speaking of Marie-Louise Fitzpatrick, if you haven't yet read her latest, Dark Warning, it's a brilliant read and I highly recommend it. Set in Dublin in the late 1700s, Taney Tyrell is a young girl gifted with 'the second sight' at a time when such things are dangerous gifts. The sense of time and place are beautifully drawn, the writing itself is lyrical and rich. Dark Warning is an eloquent, vivid read that you won't soon forget.